Allan Shivers was born in Lufkin, Texas October 5, 1907 and attended school in Lufkin, Woodville and Port Arthur. He received his BA Degree from the University of Texas in 1931 and his LLB in 1935. He married Marialice Shary in 1937 and they had four children. He was elected to the Texas Senate in 1935. Served in Europe during World War Two. 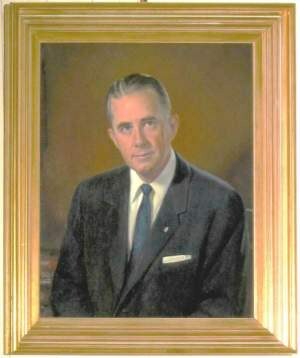 Lieutenant Governor in 1947 and 1949. After the death of Governor Jester, he became Governor and thereafter was elected to three full terms and has the distinction of having served longer in that office than any other Governor in the history of the state. He was chairman of the National and Southern Governors Conference and was President of the U.S. Chamber of Commerce in 1968. The building housing the Allan Shivers Museum was built by Robert A. Cruse in 1881. In 1963 it had to be removed to make way for a motel. Mr. and Mrs. Shivers secured possession and had it moved to the present location where it was restored and converted into a museum for the collection and display of mementos of the Allan Shivers gubernatorial service. The interior was decorated by Melanie Kahane and Associates of New York. Adjoining the museum they also constructed a completely equipped library for reading, study and research and it has become a vital contribution to the cultural life of the county. Mon.--Fri. 9:00 a.m. - 11:30 a.m. & 1:00 - 3:00 p.m.
Closed: 11:30 a.m. - 1:00 p.m.